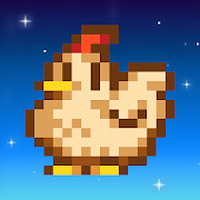 "Create your dream farm in this addictive RPG"
Game Goal: Stardew Valley is an immersive RPG, in the style of Terraria, in which the goal is to expand an old farm and, at the same time, strengthen ties with the local community. How to Play: Start the game by personalizing the character, who moves to the farm after inheriting it from his grandfather. Grow fruits and vegetables, raise animals, fish, build new structures and interact with local people. You can even start a family. Graphics: Detailed scenes and colorful pixel-art graphics. Installation requirements: A minimum of 109M of free memory space and Android OS which Varies with device. Rating: The TOP 5 Most popular games in Role Playing Games category. Tons of missions and challenges. It includes several customization options. It is not compatible with all Android versions. Do you like Stardew Valley? Battle your way through the evolution of RPG gaming!